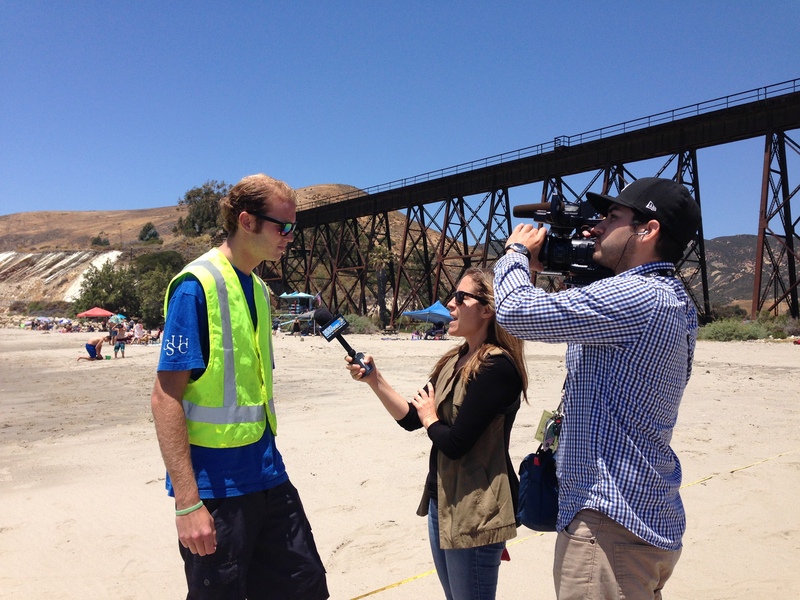 Senior ESRM major Tevin Schmitt being interviewed by KEYT3’s Alys Martinez at Gaviota State Beach on May 24, 2015. Great to see more stories focusing on our students and their dedicated efforts as the getting out into the regular coverage of spill impacts. The two most recent of these featured some of our field sampling over the weekend. Many of the students in our field crews have been canceling things right and left. This spill happened during a brief window between the end of the semester and the start of our regular summer field season when most of them plan a brief period of relaxation. The three recent stories that best highlight our student-centric approach were Alys Martinez’s and Kelsey Gerckens’ pieces for Santa Barbara’s KEYT3 news and Megan Diskin’s piece for the Ventura County Star. They are below and on our Press page. “It’s really important to do long-term monitoring programs like this to get baseline data, so you can know exactly what the communities are, before a disaster like an oil spill hits. Then, we can study after an oil spill and see what the effects truly are,” student Tevin Schmitt said. Steele has been part of a three-year study of health of the ocean, studying Southern California beaches stretching from Santa Barbara to Orange counties, she said. Through a university program called Project ACCESO, Hispanic and low-income undergraduate students from the university and other area schools such as Moorpark College and Ventura College can gain research experiences in science, technology, engineering and mathematics, Steele said. 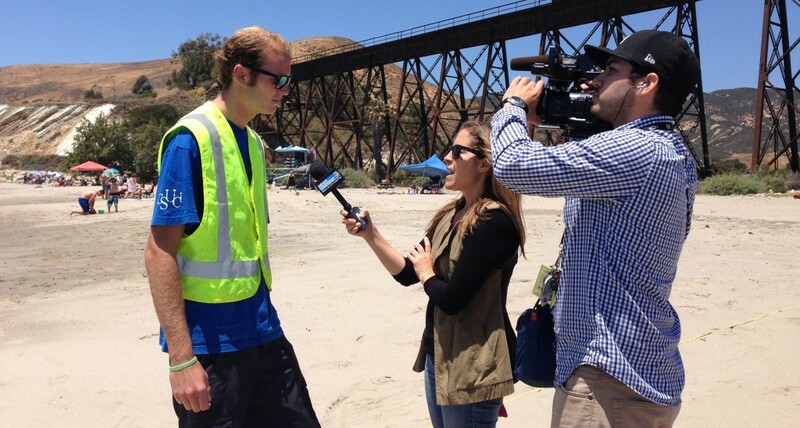 Tevin Schmitt speaking to KEYT3 news at Gaviota Beach on May 23, 2015. 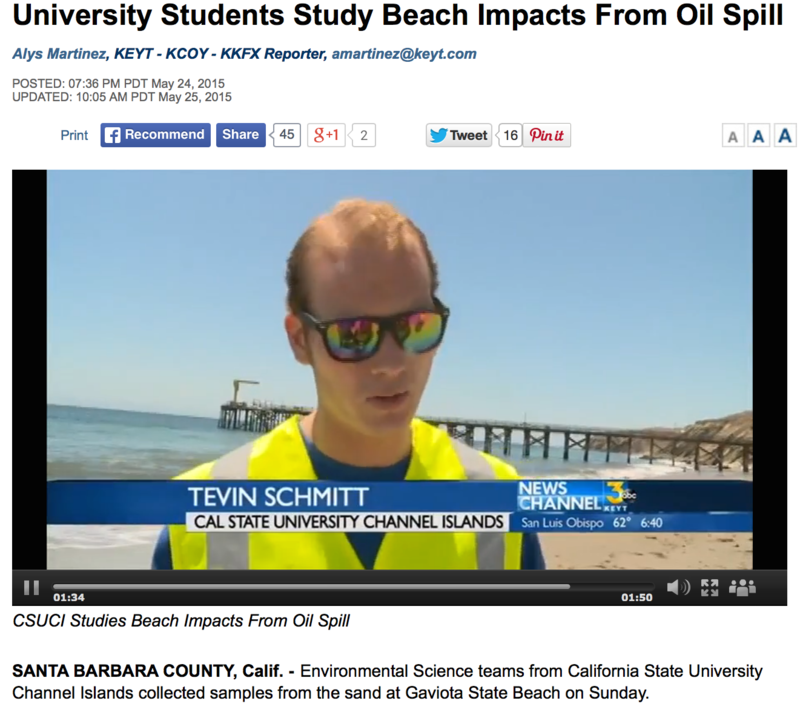 Researchers from CSU Channel Islands were trying to get ahead of spilled oil lingering in the ocean off the coast off Santa Barbara County to collect samples from area beaches before the crude hits the shore. 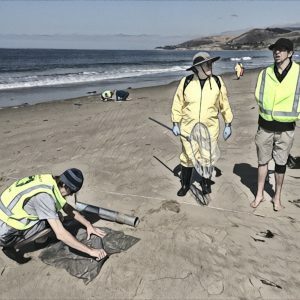 Dr. Clare Steele, a lecturer in environmental science and resource management at the Camarillo university, said she planned to lead a team of five to Gaviota State Beach on Sunday to get an idea of the waterfront’s biological diversity “so we can get a baseline of research” to measure the effects of the spill. 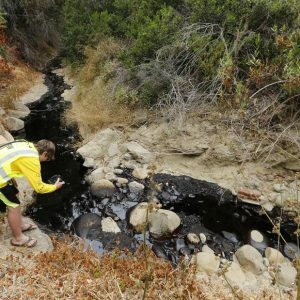 The timetable for some of their research was accelerated after as much as 105,000 gallons of oil escaped from a pipeline in Santa Barbara County on Tuesday and about 21,000 gallons of the crude made its way into the ocean off Refugio State Beach near Goleta. Some students were expected to join the study in June as part of the Summer Scholars Institute, but they’ve volunteered to start early. Steele said she hopes oil hasn’t gotten to Gaviota State Beach yet because it’s unlikely officials will let the team survey the area if it has been affected. On Sunday, a mixture of recent graduates of CSU Channel Islands and a Moorpark College student will be headed north to gather samples. Sean Anderson, an associate professor in environmental science and resource management at Channel Islands, had led a team to collect samples Wednesday to El Capitan beach near the spill. Steele said a team also collected samples Friday at Coal Oil Point. The excursions don’t just involve bottling samples of sand, Steele said. The team will look to see what kind of invertebrates, birds and marine mammals are living at the beach and whether there are dogs, people or surfers there. One key observation is to note whether kelp has washed ashore because it can be an important food source for birds, Steele said. “We’ll also count how many sand crabs there are per square meter,” Steele said. Researchers will take a “more intensive look” at creatures living in the sand because they may be a significant indicator of the effects of the nearby spill, Steele said. “The sand crabs are right there in the swash zone where the oil meets the sand,” Steele said. She said it is hard to predict the recovery time of some of the beaches affected by the spill because not all beaches naturally have the same level of biological diversity and it may change from one year to the next. Point. Mugu, CA. 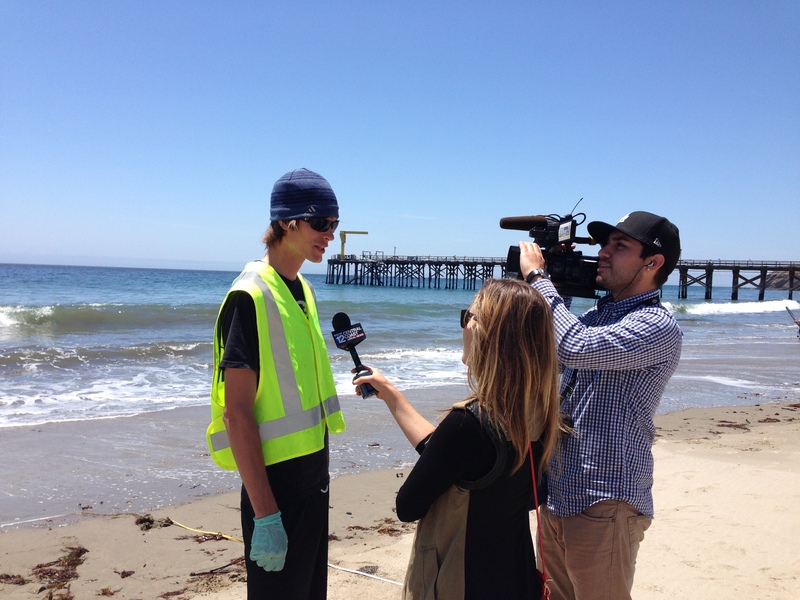 Students from Cal State Channel Islands are skipping their summer vacations to document the Refugio oil spill. 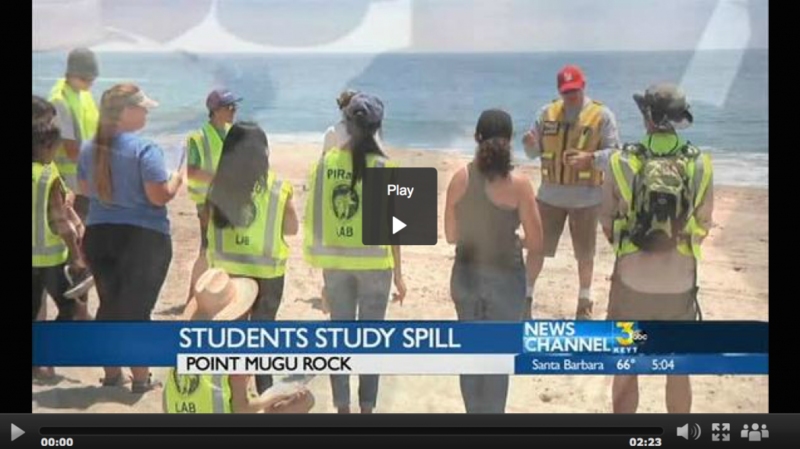 The students have been hard at work since the spill occurred, combing beaches from Santa Barbara County to Los Angeles County. The environmental science research team from Cal State University Channel Islands usually goes beach to beach counting sand crabs and documenting beach health, but now it is also documenting the amount of tar found on local beaches. The students are looking for tar balls, and oil on the surface of the ocean, as well as oil in the sand or on marine wildlife. 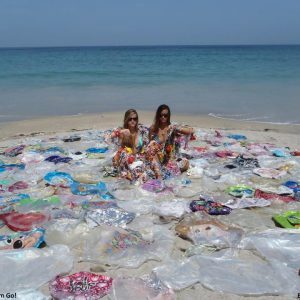 “There is definitely more tar on our local beaches than average. I have seen,” said CSUCI student Reily Pratt. “You know, it is still concerning that there is more tar,” said CSUCI student Tevin Schmidt. “Up in Santa Barbara we have a lot of oiling directly on the beach but as we get farther away and down in Los Angeles and in Ventura County we are seeing very very patchy amounts of tar much higher than we would normally expect,” said professor Sean Anderson. To find out just how much tar is related to the spill compared to natural seepage, the researchers are using a baseline– measurements and observations taken from local beaches before the spill occurred. “We are studying this and the sand crabs to get a rough estimate of beach health because that is what everything feeds on on the beach, including birds. So by studying those communities over a long period of time, we can understand those communities and when something like an oil spill happens we get a better estimate of what exactly an oil spill will do to those communities,” said Schmidt. The team said the research is critical to find out the long-terms effect the oil spill has on our environment. “As a scientist it’s an excellent opportunity for us to look at the impacts and say these are the impacts we had as people and what do we need to do to fix this,” said Pratt. 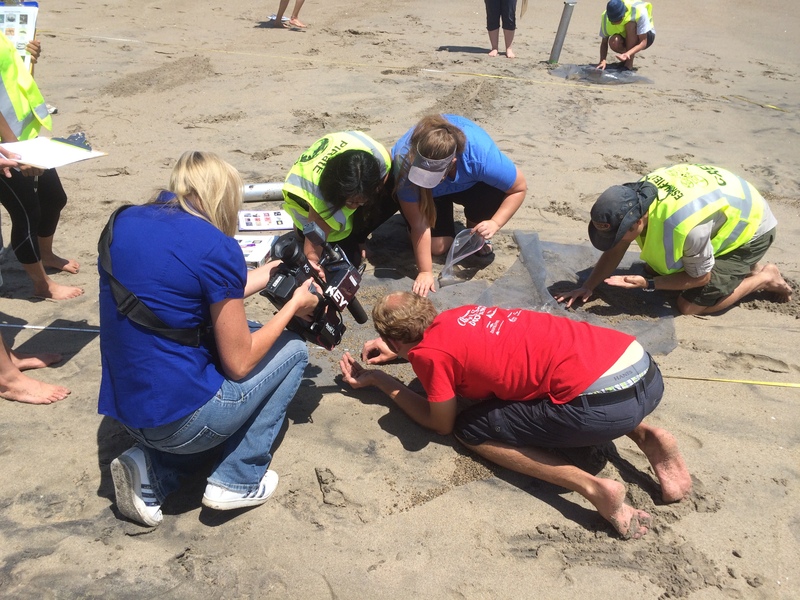 KEYT-KCOY-KKFX Reporter Kelsey Gerckens filming Tevin Schmitt and other ESRM Summer Institute Students sorting a sand core at Point Mugu State Beach on June 2, 2015.